This property is perfect for the rental market and has lots of potential. It is sat in a beautiful location with excellent views. There is a habitable part to the property then there is a section that still need works. As the property is, there is a bedroom, a bathroom, a kitchen, a lounge and a covered patio are with a barbecue. Although there is no access to the kitchen internally, this can easily be fixed by knocking through from the living room. The property has lots of character with stone exposed walls and wooden beams. The rest of the property still awaits restoration, it needs a new roof, windows, etc but if you are looking to do the work yourself, it would be no problem as you could easily live in the habitable part of the property. Although in a secluded position, it is not far away from a village with cafés and a mini market. 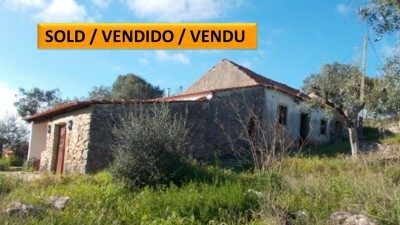 The property is situated in the village of Além da Ribeira which is around 12km from Tomar. Castelo do Bode lake, Portugal’s second largest reservoir is around a 30 minute drive from the property. This lake is popular for all kinds of water sport activities including swimming, sailing, canoeing, scuba diving, wind surfing and water skiing. The lake is also a haven for wildlife and there are many river beaches close to the property, ideal for relaxing sunny days at the water’s edge. There is also a river beach called Agroal which is situated close to the property which is very popular in the summer. Here there are some cafés and restaurants.